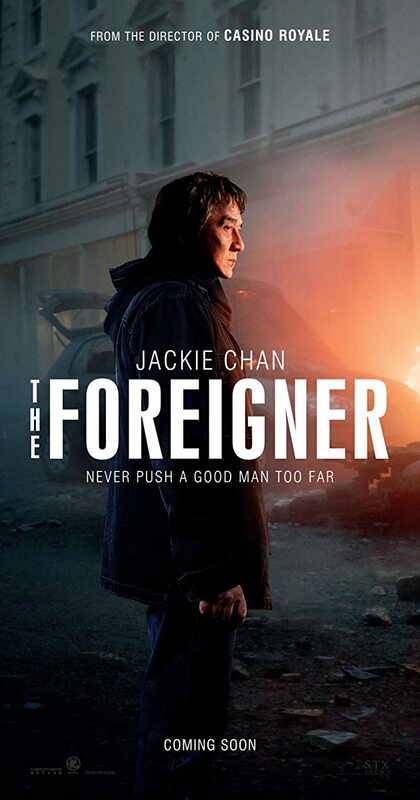 Jackie Chan has returned to the big screen in the new action thriller, The Foreigner that has a part of it that is a revenge movie and another part that is political thriller. Unfortunately, the parts do not seem to merge very well. Quan Ngoc Minh (Jackie Chan), a man with a spotted past, lost his daughter in a terrorist bombing in London and he goes on a quest to discover the names of the people responsible. This led him to former IRA member and current British government official Liam Hennessy (Pierce Brosnan), whom Quan believed could provide him the information. Jackie Chan was really good in this movie. In fact, some of the early scenes in the film were more than just Jackie doing his action stunts. He showed some serious emotional acting chops as well in the scenes where he was dealing with the death of his daughter. However, there really is little to his character besides the loss of his daughter. The film depends on you wanting to root for Jackie Chan, and does not give you another reason to cheer for him. Later in the film, the character has some layers peeled away, but by that point, I had lost the interest in any back story. I found much of the film dull. The fight scenes with Chan were well done and exciting. Some of the scenes with Pierce Brosnan were solid as well, but I found much of the remainder needlessly convoluted and unnecessary. I don’t have much else to say about this one, honestly. There are redeeming qualities about it, but not enough to make this a recommendation.